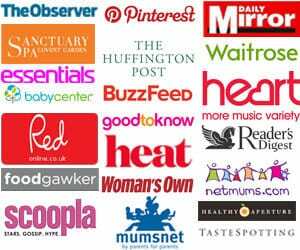 You are here: Home / Recipes / Cookies & Traybakes / Granola Bars. 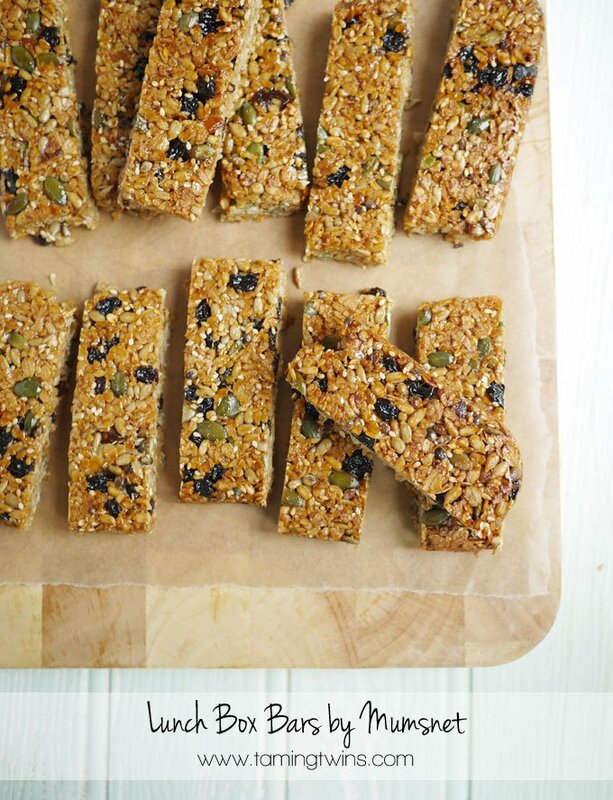 Granola Bars made with oats, fruits and seeds, with a satisfying crunch. They make the perfect after School snack, or are brilliant for breakfast on the go – a real winner! 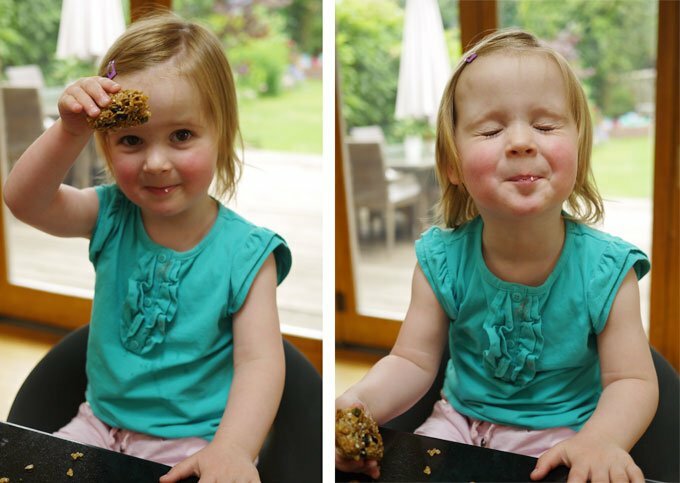 I first published this recipe back in 2014, when George and Harriet were only two and I thought it was due a re-visit. But oh my goodness, looking at these photos has been such a trip down memory lane, just look at them and their squishy toddler cuteness. 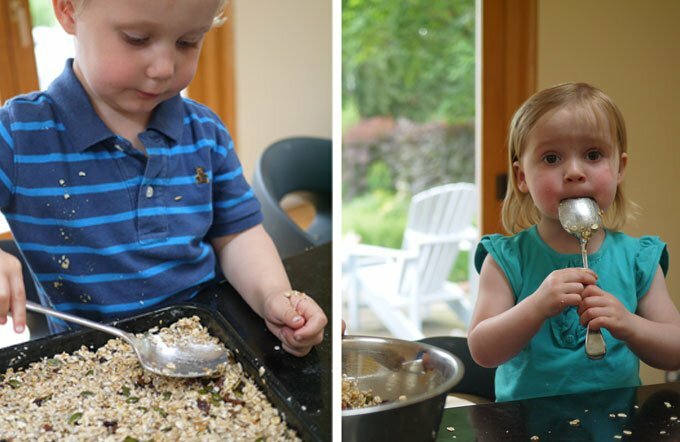 If you are aghast at the idea of cooking with your children, I promise it gets easier! 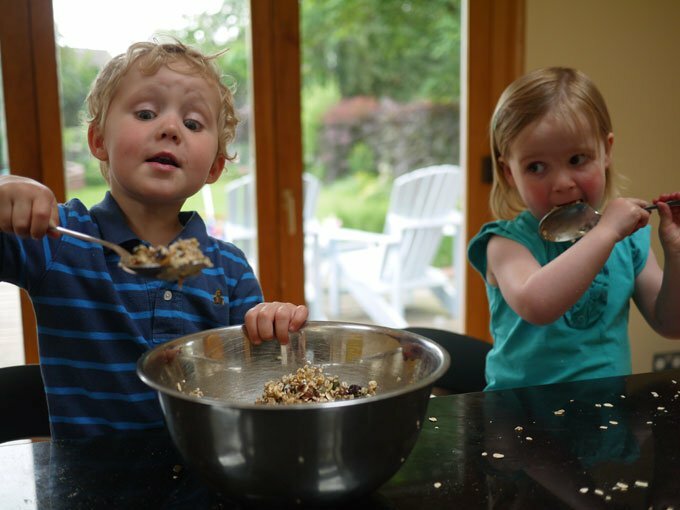 Now George and Harriet are at school I am constantly looking for ideas for after school snacks for them. If I don’t arrive at the school gates brandishing some form of sustenance I am greeted with a surly, “Have you got anything to eat” so I’ve learnt that it is in EVERYONE’s best interest for me to have something on hand they can tuck into immediately. Whilst I don’t manage it all the time, I do like to have a batch of home-made goodies for them when I can. If they can also help with the making of said snacks them it’s even better. These Granola Bars fit the bill perfectly. George and Harri love them, and they make a great mid morning snack for me when I’m busy working. 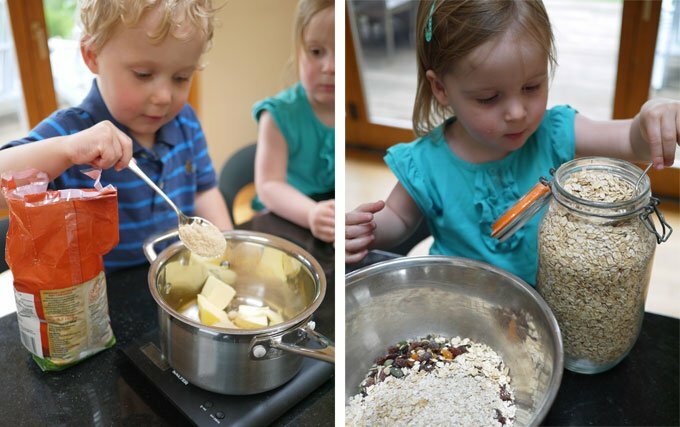 How do you make Granola Bars? I used half jumbo oats and half normal oats to make these Granola Bars. If you only have one type, I’m sure either would be fine, but I liked the texture that at least some jumbo oats gave. Cut them with a sharp serrated knife. 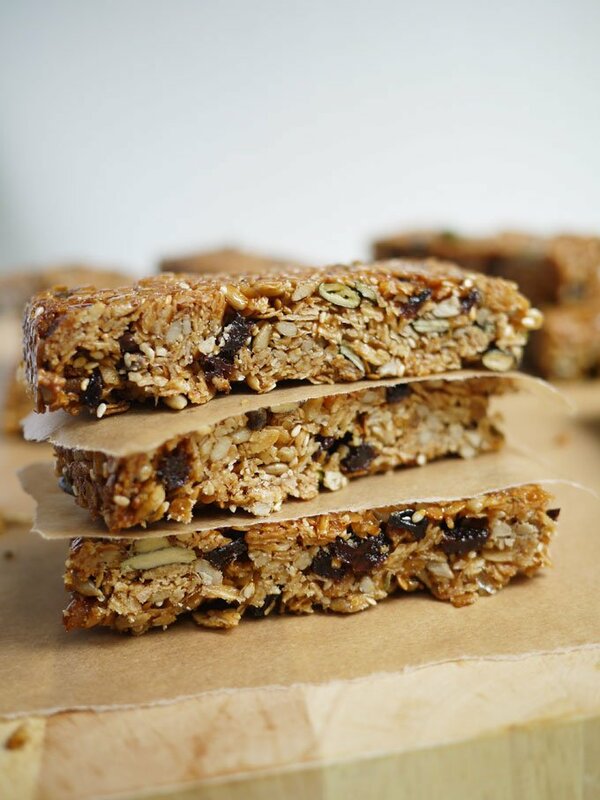 Ensure the Granola Bars are almost completely cold before cutting, it will stop them from crumbling and falling apart. These are fabulous snacks and lunch box bars for children and adults. Preheat the oven to 160C/fan 140C/gas mark 3. Butter an 18cm x 25cm shallow tray-bake tin and line the base with greaseproof paper. Toast the oats and seeds, separately in a baking tray in the oven until lightly brown; this will take five to 10 minutes. Watch them carefully, as they burn quickly. 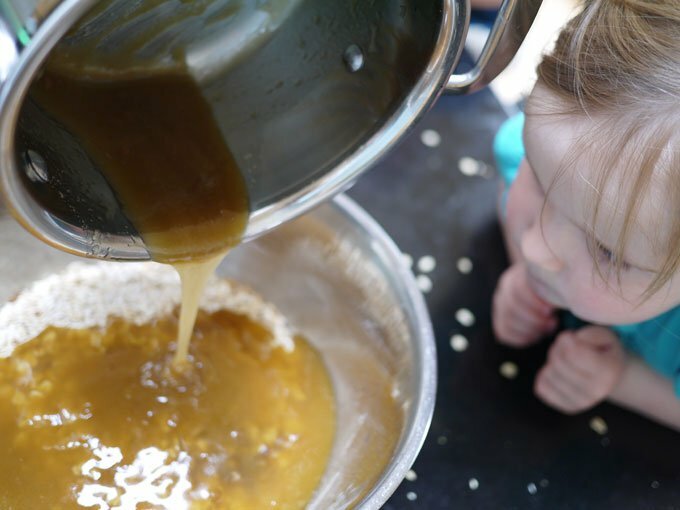 Warm the 100g of butter, the honey and sugar gently in a saucepan. Don't let the mixture boil. Add the toasted oats and seeds and the dried fruit, plus the cinnamon, if you like it, to the saucepan. Mix until everything is nicely coated. Top into the tin, press down lightly and bake for 30 minutes. Allow the bake to cool in the tin before you slice it into 12 bars, otherwise they will crumble. 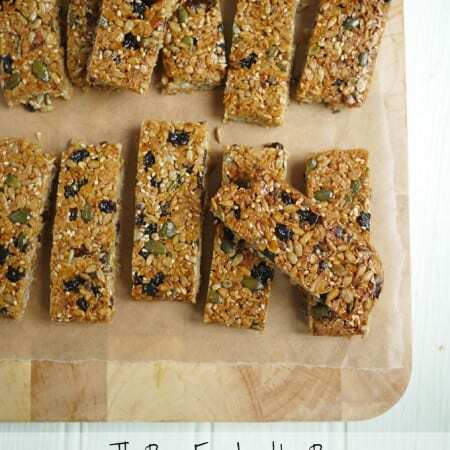 Wow delicious and healthy bars, love the brown paper styling too and your kids are beautiful! Thanks for linking up to #tastytuesdays we’ll be making these!